Thank you for choosing Writ Legal, LLC (referred to hereinafter alternately as “Writ Legal/Our/Us”) for your legal support service needs. Writ Legal offers a host of support services to aid you in your legal pursuits including, Service of Process, Skip-Tracing, Document Retrieval, and Court Filing and Research (the Services), subject to the terms and conditions of this Writ Legal Services Agreement (the Agreement). This Agreement is a legal document which constitutes a valid, binding, and enforceable contract between you, the Client, and Writ Legal. Please carefully read this entire Agreement so that you fully understand it, prior to using the Writ Legal website and/or engaging our Services. By either using the Writ Legal website or employing our Services, you acknowledge your understanding of, and agree to strictly adhere to all of the terms and conditions of this Agreement, as amended from time to time. IMPORTANT NOTE: The provision of Services is expressly conditioned upon your agreement to be bound by these terms and conditions. Hence, Writ Legal will not render any Services to you, unless you unconditionally agree to the terms and conditions of this Agreement. Client— You may be referred to alternatively throughout this Agreement as “you” or “Client”. For the purposes of this Agreement, “Client” refers to any natural person acting on his or her own behalf, or any principal, whether natural person or entity, which has authorized an agent, to employ the Services of Writ Legal, uses the Writ Legal website, or signs any Writ Legal form(s) or documents for the purpose of ordering, authorizing, canceling or terminating Services “You” refers, to any agent authorized to act on behalf of a principal (natural person or entity) or the Client, as the case may be. Acceptance and Agreement of Writ Legal Terms and Conditions— You accept and agree to the terms and conditions of this Agreement by either using the Writ Legal website or engaging our Services. IMPORTANT NOTE: Writ Legal understands that in certain instances you may use the Writ Legal website or the Services on behalf of a person or entity other than yourself. If you are entering this Agreement on behalf of another person or entity, you expressly represent and warrant to Writ Legal that you have the right and authority to make this Agreement on behalf of the actual Client, and you are empowered to legally bind said Client to the terms and conditions hereof. Use of www.writlegal.com (the “Website”)— By using www.writlegal.com, you affirm your understanding of, and consent to be bound by the terms and conditions of this Agreement. You represent and warrant to Writ Legal that you will not use the Website in a manner contrary to the terms and conditions of this Agreement or for any unlawful or prohibited purpose. Ownership and Control of www.writlegal.com (the “Website”)—Writ Legal maintains the sole proprietary interest in this Website, and exercises exclusive control and decision-making authority with respect to its use and content. Third Party sites and external links— Certain pages on Writ Legal’s website may contain links to external webpages. These external links, including the webpages to which they are directed, are owned and operated by third parties, unaffiliated with Writ Legal. The links have been included on our website for informational purposes only, as a convenience to you. Your use of these links constitutes your acknowledgment and understanding that Writ Legal does not exercise any authority or control over these external links. You affirm and agree that Writ Legal is not liable for any claims arising directly or indirectly from their use or relating to the content of any associated webpages. Writ Legal makes no representations or warranties as to the contents of these external links and related webpages, and expressly disclaims and repudiates any inappropriate or offensive content. Finally, by accessing or using our website, you expressly affirm that Writ Legal bears no responsibility for any aspect of such third party sites, including but not limited to, the accuracy or completeness of any content, copyright compliance, legality, or decency. Use of or reliance upon any information or other content obtained or derived from any external links, webpages, or third party sites is at the Client’s own risk and peril. Client Online Registration and Privacy— You may be required to register and open an account with Writ Legal in order to take advantage of certain features of Writ Legal Services and access particular areas of Writ Legal’s website. Following registration, you will be permitted access to restricted service features and website areas through the use of a username and password. As a part of the registration process, you will be assigned a user name and password. You acknowledge and agree that maintaining the confidentiality of your password and username is solely and exclusively your responsibility. As an express condition of this Agreement, you agree to submit current, accurate, and complete information about yourself, including without limitation your full legal name, current business address and telephone number, and business email address and 2.) to promptly and regularly update all of your information in order to maintain current, accurate and complete records on file with Writ Legal. Writ Legal reserves the right to terminate this Agreement, your website privileges, and your use of Services, if you provide any inaccurate, out-of-date or incomplete information. You further acknowledge and agree that you are fully and completely responsible for any and all activities or transactions performed through your account including service requests. In the event that you believe your Writ Legal username or password has been compromised, or the security of the username or password have been otherwise jeopardized in any way, please contact our office immediately so that we may terminate any unauthorized service requests and change your password. Authorization and Agreement to Transacts Business Electronically— You hereby authorize Writ Legal, at its sole and absolute discretion, to transaction any and all business with you pursuant to this Agreement via electronic means. For the purposes of this Agreement, electronic presently refers primarily to electronic mail and/or facsimile or certain functions requiring you to submit a form through the Writ Legal website. By signing the Writ Legal Client Authorization form, you certify that electronic communication, whether via facsimile, email, or otherwise, is acceptable as the sole and exclusive form of communication between Writ Legal and you. Amendments— Writ Legal reserves the right, at its sole and absolute discretion to amend, change, alter, modify or void this Agreement, wholly or in part, by removing the existing Agreement from this website and posting an amended version to replace it. Changes to this Agreement may occur without notice and are immediately effective upon posting; superseding all previous posted versions of this Agreement. Please review this Agreement periodically for changes. You may refer to the “last updated” notification appearing at the top of this Agreement to determine the most recent version of this Agreement. By using or continue to use the Writ Legal website or our Services, subsequent to the posting of any changes to this Agreement, you certify your acceptance of and agreement to such changes. Affirmations and Declarations— As an express condition of your use of this website, you declare or affirm, under the penalties of perjury, in accordance with the laws of the State of Maryland or such other respective State from which you are accessing or using our website, that (a) you will fully comply with the rules, regulations, ordinances and laws of any state from which you are transacting business with Writ Legal, and (b) agree that if you use Writ Legal to violate any such rules, regulations, ordinances and laws, you are subject to civil and criminal penalties. By using this website, you further acknowledge that the information furnished by Writ Legal has been obtained or derived from the databases of primary sources around the country including federal, local, state and municipal governments, and this information may contain inaccuracy, dated material, errors and omissions or might otherwise be incorrect in some respects. Fees and Taxes— Writ Legal has the absolute right and sole discretion to determine the fees to be charged to you for any Services. Writ Legal’s fees may vary depending upon several factors including, but not limited to, the type of Service, Service volume, location of Service, urgency of Service, and time required to complete Service. Current fee schedules are available upon request by contacting us at 1.888.667.2038. IMPORTANT NOTE: Writ Legal reserves the right, however, to change, modify, or amend its fee structure, at any time, without prior notice. As of June 1, 2011, Writ Legal does not charge taxes to its Client for any Services rendered. Should Writ Legal be required to collect or pay any taxes pursuant to any applicable laws (past, present or future) based upon Services furnished you, such taxes will assessed against your account in amount equal to the exact dollar value of the levy Writ Legal is obligated to collect or pay. Service Guidelines and Procedures— This Agreement includes the Writ Legal Service Guidelines and Procedures, which are incorporated in these terms and condition in their entirety. You certify that you have carefully read and fully understood the Writ Legal Service Guidelines and Procedures. Further, as an express condition of this Agreement, you accept and agree to be bound by the Writ Legal Service Guidelines and Procedures, as amended from time to time. Payment Terms and conditions— Writ Legal accepts the following methods of payment: cash, money order, international money order, certified check, personal check, business check, and credit cards (Visa, Mastercard, and American Express). As a precondition to the provision of Services, you must submit to Writ Legal a signed and completed Client Authorization Form and Payment Information Form. The payment of fees is required prior to the commencement of Services and must accompany the Client Authorization Form. PLEASE NOTE: The completion of the Client Authorization form is a one-time process, which is mandatory for all new clients. Upon completion of your initial business transaction(s) with Writ Legal, your account will automatically will be eligible to be a Credit Account. Writ Legal reserves the right to determine the creditworthiness of any Client, in its sole and absolute discretion, or to restrict the credit of any Client for any reason. If you pay your account based on the credit terms, you will be eligible to be invoiced and not required to pre-pay for services. You agree to pay all invoices within (30) days of the date stated on each respective invoice in accordance with our standard terms for credit. Recurrent credit card billing is available for Clients who either elect not to open a Credit Account or for whom a Credit Account is not a reasonable option. Finally, Clients may chose to authorize the prepayment of Services via credit card in a single, lump sum payment or a series of installment incremental payments for Services as provided, until the full dollar value of advanced funds has been depleted. You understand and agree that your credit card does not have to be physically present with Writ Legal at the time of processing and the validity of any such charges shall not be challenged. Any person or entity (firm, company, organization, or otherwise) to whom credit is grant shall be and remain solely responsible and liable to Writ Legal for payment of all invoices. Nothing in this Agreement shall prohibit a third party from paying any invoice on behalf of a person or entity to who credit has been granted. However, you understand and agreed that Writ Legal does not have any relationship with any such third parties, and is under no obligation to collect any sum from them for your benefit. As the person or entity who employed Writ Legal to perform the Service(s), you are obligated to pay all invoices, regardless of whether or not the invoices have been submitted to any third parties for payment. You shall not be released from your obligation to pay Writ Legal, unless or until full and final payment has been made. As a convenience, Client will receive an electronic copy of an invoice in addition to the hard copy once their affidavit/proof of service is prepared. IMPORTANT NOTE: Writ Legal may apply a FINANCE CHARGE of one-and-one half percent (1-1/2%) per month for past due balances exceeding 30 days. This is an ANNUAL PERCENTAGE RATE of eighteen percent (18%). If you fail to pay any amount due to Writ Legal, you agree to pay all collection costs and reasonable attorney fees. Disclaimer of Warranties and Limitation of Liability— You acknowledge and agree that you are using the Writ Legal’s website, including any webpage content or information, and our Services solely and exclusively at your own risk and peril. Writ Legal makes ABSOLUTELY NO GUARANTEES OR PROMISES relating to our website or Services. To the maximum extent permitted by applicable law, all information, software and services are provided “AS IS”, without warranty or condition. Writ Legal disclaims all warranties and duties (express, implied or statutory) and otherwise assumes no obligations of any kind including, without limitation, implied warranties of merchantability, fitness for a particular purpose, title or non infringement, or duties of workmanlike effort or lack of negligence. Writ Legal accepts no responsibility and assumes no liability arising out of, connection with, or relating to the website or related software including, but not limited to, services, products, construction, design, graphics, use, capabilities, functionality, specifications, content, postings and access. You acknowledge and agree, without limiting the effect of the foregoing, that Writ Legal makes no warranties and assumes no duties relating to the adequacy, completeness, suitability, reliability, appropriateness, availability, accuracy, effectiveness or timeliness of our Services or any information, software, products or services included on or available through our website for any purpose. You accept and assume complete responsibility for safeguarding and protecting your systems from all hazards, ensuring the accuracy of and maintaining the integrity of your data and retrieval and/or restoration of loss information. You acknowledge, understand, and agree, that in the event of any breach of this Agreement by Writ Legal or its subsidiaries, partners, affiliates, contractors, employees, agents and consultants, your sole remedy will be to have the Service which proximately caused damages to you cured or corrected. No incidental or Consequential Damages— To the maximum extent permitted by applicable law, the full aggregate liability of Writ Legal and its subsidiaries, partners, affiliates, contractors, employees, agents and consultants, collectively, under this Agreement or arising out of the Services shall not exceed the amount actually paid by Client to Writ Legal under this Agreement, regardless of whether such liability is based in law or equity, or grounded upon theories of breach of contract, tort, strict liability, breach of warranties, failure of essential purpose or otherwise. In the event that Writ Legal is performing Services for Client in connection with a multiphase engagement, Writ Legal’s liability shall be limited to the fees paid to Writ Legal for the specific phase giving rise to liability. IN NO EVENT, HOWEVER, SHALL Writ Legal OR ITS subsidiaries, partners, affiliates, contractors, employees, agents and consultants BE LIABLE FOR CONSEQUENTIAL, INCIDENTAL, PUNITIVE, SPECIAL OR EXEMPLARY DAMAGES, (INCLUDING LOSS OF PROFITS, DATA, USE, SALES, BUSINESS OR GOODWILL), REGARDLESS OF WHETHER SUCH LIABILITY IS BASED IN LAW OR EQUITY, OR ARISES OUT OF BREACH OF CONTRACT, TORT, STRICT LIABILITY, BREACH OF WARRANTIES, FAILURE OF ESSENTIAL PURPOSE OR OTHERWISE, EVEN IF IT HAS BEEN WARNED OF THE POSSIBILITY OR LIKELIHOOD OF SUCH DAMAGES. Indemnity— You agree to defend, indemnify, save and hold harmless Writ Legal and its subsidiaries, partners, affiliates, contractors, employees, agents and consultants and their respective officers, directors, members, agents, and representatives (collectively, the “Indemnified Parties”) from and against any and all losses, liabilities, claims, damages (including incidental and consequential damages), and expenses (including costs of investigation, defense and reasonable attorney’s fees, with or with suit, whether arising out bankruptcy or on appeal) (collectively, “Damages”), arising out of, connected with or otherwise related to you (1) breaching any term(s) of this Agreement, (2) using the Services of Writ Legal, (3) failing to pay any and all sums due to Writ Legal, (4) failing to pay any and all sums due to any other person or entity, including government agencies, (4) violating any rules, regulations, ordinances, or laws of any jurisdiction through the use of Writ Legal Services or our website, (5) furnishing inaccurate, out-dated, erroneous, or incomplete information, (6) acting or failing to act, directly or indirectly, based on information contained on Writ Legal’s website. Termination and Cancellation Policy— Writ Legal reserves the right to suspend, cancel or terminate your Services and website privileges, with or without cause, at any time. Such suspension, cancellation or termination may occur without notice. Any suspected fraudulent, abusive, or illegal behavior may be ground for terminating your relationship with Writ Legal and may be subject to referral to law enforcement authorities. Upon suspension cancellation or termination your use of Services and website privileges shall instantly cease and, in the case of cancellation or termination, Writ Legal may immediately deactivate and delete your user account and all related files, documents and information in your account. You further agree that in the event that your use of Services and website privileges are suspended, cancelled or terminated, Writ Legal and its subsidiaries, partners, affiliates, contractors, employees, agents and consultants shall not be liable to you or any third party for any compensatory, consequential, incidental, punitive, special or exemplary damages, (including loss of profits, data, use, sales, business or goodwill), regardless of whether such liability is based in law or equity, or arises out of breach of contract, tort, strict liability, breach of warranties, failure of essential purpose or otherwise, even if it has been warned of the possibility or likelihood of such damages. Any suspension, cancellation or termination shall not relieve you of your obligation to pay any sums owed to Writ Legal for fees and expenses incurred through the date of suspension, cancellation or termination. Intellectual Property Rights— As an express condition of this Agreement, you acknowledge and agree that, unless expressly stated otherwise, Writ Legal’s website and content are proprietary and subject to intellectual property law protection. Writ Legal reserves the right to suspend or halt Services, including access to and use of the website and online registration for any person or entity it deems to be infringing on such rights. Comments and Suggestions— By using our website and Services, you acknowledge and agree that all comments and suggestions, in any form, submitted to Writ Legal for any reason shall be the property of Writ Legal for all purposes. Writ Legal shall have an unrestricted right to use and disclose any comments or suggestions in any manner deemed appropriate, without any duty of confidentiality. Governing Law— These terms and conditions will be governed by and construed in accordance with the laws of the State of Maryland, exclusive of their conflict of law principles and any disputes relating to these terms and conditions will be subject to the exclusive jurisdiction of the courts located within Montgomery County, Maryland. Both you and Writ Legal waive any jurisdictional or venue defen­ses which may otherwise be available and consent to the jurisdiction of such courts. Force Majeure— Writ Legal shall not be held liable for any interruptions in service, delays in performance or nonperformance (partial or complete) caused by, resulting from or arising out of circumstance beyond its control, including but not limited to natural disasters, strikes, lock-outs, governmental actions, civil calamity, inclement weather, or acts of war. Exclusion of Third Party Rights— This Agreement is intended solely and exclusively for the benefit of you and Writ Legal and is not intended to confer any rights or remedies or impose any obligations upon any other person including any third party beneficiary. General Provisions— This Agreement may not be assigned without the prior express written consent of the other party and any purported assignment without such consent shall be deemed null and void and without legal effect. If any provision of this Agreement is held by a court of competent jurisdiction to be invalid, illegal or unenforceable the remaining portion of the Agreement will not in any way be impaired and shall continue in full force and effect. A parties’ failure to strictly enforce any provision of this Agreement shall not constitute a waiver of such provision, any other provision or continuing waiver. Except as otherwise provided, this Agreement may not be modified, amended or changed by the use of any other document(s) The section headings contained in this Agreement are for reference purposes only and shall not affect the meaning or interpretation of this Agreement. To the extent that the Website and related information are in conflict or inconsistent with this Agreement, this Agreement shall govern. Effect of Agreement— This Agreement, as amended from time to time, which includes your Writ Legal Client Authorization form, Writ Legal website consents, Writ Legal disclosures, Payment Information form, Writ Legal Credit Account, constitutes the entire, fully integrated agreement between you and Writ Legal. It revokes and supersedes all prior or contemporaneous understandings and commitments, and is intended as a complete and final expression of the agreement between Writ Legal and you. Paperless Entity— In an effort to go “Green” and protect the environment, Writ Legal has constituted itself as a paperless entity. What this means in practical terms is that Writ Legal does not maintain paper copies of many of the documents and other materials it handles for Clients. Rather, Writ Legal retains electronic copies of the information in a secure, encrypted network. IMPORTANT NOTE: Writ Legal does maintain ORIGINAL documents, however, in instances where such documents are required to be filed with an original affidavit/return of service or legal process is required to be served upon a party or witness pursuant to the laws governing service of process. You must request in writing to have any ORIGINAL or copy of a legal document that has been served returned to you. Any such request must be stated in the appropriate section of the Writ Legal Services Request form (or letter of request for service(s)) prior to the commencement of Services. Trademarks– The trademarks, names, logos and service marks (collectively “trademarks”) displayed on this website are the trademarks of Writ Legal. Nothing contained on this website shall be deemed or construed as granting a license, privilege or right to use any of the aforementioned trademarks without the express prior written consent of Writ Legal. Severability— In the event that any provision or part of this Agreement is held to be invalid, illegal or unenforceable by a court of competent jurisdiction, such offending language deemed amended or modified to the minimum extent necessary to effect the intent of the parties, and as so changed shall, will continue in full force and effect, without impairment. However, an adjudication of invalidity, illegality or unenforceability with respect to any provision or part of this Agreement shall be strictly limited to the jurisdictional confines of the court making such findings. Acknowledgment— By signing the Writ Legal Authorization form and using the Services of Writ Legal, you certify that you have read, understood, and agreed to abide and be bound by the terms and conditions of this Agreement, and comply with all applicable federal, state, and local rules, regulations, ordinances and laws relating to the use of Writ Legal Services. Writ Legal, LLC (“Writ Legal”) offers a myriad of legal support services including Service of Process, Skip-Tracing, Court Filing and Document Retrieval (the “Services”). The fees charged for the Services of Writ Legal are based on the particular level of service requested by the client. Correspondingly, the level of service depends upon the number of days in which Services must be attempted, in the case of Service of Process and/or Court Filing and Document Retrieval, and the comprehensive nature of the research to be performed, in the case of Skip-Tracing. Writ Legal does not guarantee service results; however, a server will attempt to perform service of process and/or attempt to retrieve requested documents for each client within the time frame specified by the client. IMPORTANT NOTE: Our service fees are earned on the basis of attempts, and are not contingent upon successful completion of the Service. Below you will find guidelines and procedures that will assist you in better understanding how Writ Legal processes your request and service needs. Service of Process/Document Retrieval/Court filing— Writ Legal always makes a concerted and diligent effort to serve, retrieve or file your documents in accordance with the specifications of the Service(s) chosen (e.g. attempts within the required time frame for the selected level of Service). Once the client submits a service request to Writ Legal, the client will receive an email confirmation. Writ Legal customer service staff may communicate the progress of the Service to the client at various stages of the process. The client can also monitor and track the status of the service request online via the Writ Legal website case portal. Once service has been completed, the client will be notified via email/fax/phone. Notwithstanding the foregoing, it is the client’s sole responsibility to monitor the status of their service request(s). Handling Issues— Writ Legal will notify the client in the event of issues or concerns relating to Service of Process, including a “bad address.” Email notification will also be posted online in the client’s account for viewing and record keeping purposes. Client Communications— Writ Legal will make two (3) attempts to communicate with a client before closing a case due to lack of responsiveness. Writ Legal will close all cases involving Services where any client has failed to respond within 15 days of the third communication from Writ Legal regarding the status of the case. In the event of closure, Writ Legal will provide suggestions to the client regarding alternative steps and a detailed affidavit of Due-Diligence. Process— All proofs and affidavits of service (except non-federal, non-service and due-diligence proofs or affidavits of service) will be filed with the court via USPS first class mail (without tracking information) free of charge. For an additional fee, Writ Legal will expedite the proof/affidavit of service or non-service to either the court or the client. Please see our rates schedule for more information. Please note: All of the above information must be accurate to avoid incurring additional service charges. Writ Legal shall follow the rules of civil procedure of the jurisdiction for the court of record where the documents being served were filed, even if the client does not provide instructions for handling the service. In certain instances, the state in which service is being attempted may have specific jurisdictional rules which may supersede the rules of civil procedure for the jurisdiction where the service documents were filed. Any special service requirements or instructions a client has MUST be conveyed in writing on the Service Request Form at the time the service is being requested. IMPORTANT: Writ Legal will not accept special requirements after the service request has been attempted. Independent Contractors— Writ Legal has agreements with various independent contractors across the United States including, process servers, investigators, constables and deputies to complete our Services. If you have had an unpleasant, disappointing or otherwise poor experience with the services of any company or individual, please provide the name, address, telephone number and any other information that you may have regarding your experience, so that you services can be performed by a different process server. Writ Legal regularly checks the credentials of its independent contractors’ to ensure compliance with and adherence to Writ Legal’s guidelines of conduct, integrity and ethical standards. Resource Center— Writ Legal offers a “Resource Center” section on its website that could be accessed by clients or website visitors. The Resource Center consists of “Process Serving Laws” or “Service of Process State Rules Guide” and “Process Serving Terminology.” The information in the Resource Center is designed as an informational tool only. Writ Legal makes a concerted effort to stay current with the latest rules/laws/information regarding the content in the Resource Center. For the most updated information Writ Legal’s clients must routinely check and consult with their respective court/state/clerk or similar to confirm that the information that is presented on the Resource Center of the Writ Legal website to ensure accuracy with respect to the information presented. Process Serving Laws or Service of Process State Rules Guide— Writ Legal is a legal support services company, and not a law firm. Although many of our clients are in the legal profession, such as law firms and attorneys, we, ourselves, are not engaged in the practice of law nor do we offer legal advice or counsel of any kind to our clients. The information contained on our website is provided for informational purposes only, as a convenience to our clients and is not intended to be relied upon for any reason whatsoever. This information is derived from various primary sources such as state legislative and judicial branches of government throughout the country and should not be construed as legal advice. Writ Legal works diligently to remain current with respect to the latest rules, regulations, laws and other information relating to service of process nationwide, however, due to the continuously changing nature of American jurisprudence, Writ Legal shall not be held liable for any omitted, incomplete, erroneous or outdated information contained or displayed on the Process Serving Laws or Service of Process State Rules Guide section of the Writ Legal website. For the most updated information, Writ Legal’s clients should routinely check and consult with their respective state legislature to verify the information presented on the Process Serving Laws or Service of Process State Rules Guide section of the Writ Legal website. Service Warranty and Cancellation of Service— Writ Legal does not guarantee or warrant service of process upon any person or entity, however diligent attempts will be made to serve your documents in each case. Our fee for service of your documents is not contingent upon success, but is strictly based upon attempts to make service ONLY. Absolutely no refunds will be made for unsuccessful service of process. When service is attempted but not completed, a bad address fee will be charged to the client, equal to the fee which would otherwise be payable for the level of service chosen. Example: The service fee for Standard Process is $65. If you choose Standard Process, we will attempt service at the address you provide on up to 4 separate occasions. If service cannot be made, the address may be deemed a “bad address”, and the $65 fee will apply, notwithstanding the fact that service was not completed. Thereafter, should you elect to continue service efforts and you provide us with an alternate address (1), you will be assessed an additional $65, which represents a new service address fee, regardless of the level of service previously selected. Clients may cancel Services at any time prior to completion. If Services have not commenced, the client shall be entitled to a full refund. If Services have commenced, however, the client shall not be entitled to any refund whatsoever. This cancellation of service policy applies to ALL Services of Writ Legal, including: Service of Process, Skip-Tracing, Court Filing, and Document Retrieval. (1) If skip-traces are requested the following extra costs are applicable. An additional $25 will be charged for a simple skip trace and an extra $75 will be assessed for a smart skip trace. Skip-Tracing Policy— Writ Legal offers three Skip Trace options for its clients, Simple Skip, Smart Skip, and Skip Trace Plus, and makes reasonable efforts to determine the whereabouts of the subject of the search, whether individual or entity, based upon the information made available to Writ Legal at the time research is conducted. Note: Writ Legal can only make reasonable inferences based on the information furnished by the client at the time of Service. The skip-tracing fee is based on the research conducted and a report provided to the client upon completion of the research. Writ Legal does not guarantee that the skip-trace will reveal the current location of the subject being researched. The information generated merely represents the possible whereabouts of the individual or entity, based upon research results, deductive reasoning and past experience. 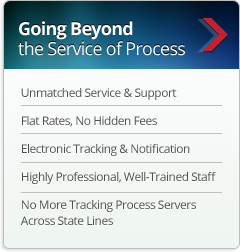 Simple Skip Trace Guide— The Simple Skip trace option is only available prior to service of process. In the event that Writ Legal provides the client with an inaccurate address as a result of the Simple Skip trace and Writ Legal is not able to successfully complete service of process, the client will NOT be charged for the Simple Skip trace. In such cases, the client will only be billed for the service of process fee at the level of service requested by the client. Clients must confirm in writing the exact address where Writ Legal should attempt service. Client will be charged for the Simple Skip trace, only if legal process is successfully served at the address yielded from the research conducted through a Simple Skip trace which exactly corresponds to the address provided by the client BEFORE service of process begins. Smart Skip Trace Guide— The Smart Skip trace is available as a stand-alone option or at any stage of the service of process request whether before, during, or after. If the client requests the smart skip-trace service, Writ Legal will provide the client with a possible service address in a detailed report generated from research performed on the subject. The client must provide written confirmation of approval for any service address identified through the Smart Skip trace. There are ABSOLUTELY NO REFUNDS for unsuccessful efforts or attempts to locate a subject using this level of skip tracing research. If Writ Legal attempts service at the address obtained through the Smart Skip trace, but is not able to successfully serve the legal process, the Client will, nonetheless, be billed for the Smart Skip trace and the service of process fee will also apply. Skip Trace Plus Guide— The Skip Trace Plus Service is available as a stand-alone option or may be used by clients who are interested in more than just locating an individual/entity for service of process. The comprehensive nature of the research involved in this level of skip trace inquiry can reveal information useful in the enforcement of judgments, such as: asset and bank account information. As a result of the extensive and time consuming nature of the research required, the Smart Skip Trace Plus Service can take several days to several weeks to complete. The Smart Skip Plus will provide you with all of the information provided in a Smart Skip trace PLUS more in-depth and difficult to obtain information regarding the individual/entity in question. Upon the completion of the search, a detailed report will be provided to the client. Due to privacy laws, Writ Legal only provides skip trace services to those clients who have court actions pending against the individual or entity being researched. Evidence of the pending action must be provided to Writ Legal before any skip-trace services will be performed. Document Retrieval Policy— Writ Legal’s document retrieval service fees are equal to the service of process fees for the corresponding levels of service selected. 1. The client must provide all of the specific details regarding the retrieval in writing BEFORE the service request is dispatched to the courier for retrieval. for ATTEMPTING to retrieve the documents in question. documents (“wait-time fee”). The first 30 minutes of wait-time is free. d. The client is responsible for all requisite printing fees as designated by the respective court. 2. Pursuant to a written request, upon the completion of any document retrieval assignment, Writ Legal will provide the client with proof of printing fees. 3. Writ Legal will advance printing fees on behalf of the client if the total dollar value of the printing fees for all documents retrieved, at the time of the service, is less than or equal to $50. If the cost of the documents to be retrieved exceeds $50, and the client has not provided the requisite funds to pay for the documents at the time of Service, the documents will not be retrieved. In the event of non-retrieval based upon costs exceeding $50, the client will be charged the retrieval fee and contacted with available options. Based upon the foregoing, clients are encouraged to take all necessary and reasonable measures to ensure that either the costs of retrieval is less than $50 or Writ Legal has been provided with the requisite funds to complete the transaction. Once the documents are obtained, Writ Legal will fax or email a copy of the documents and forward the original copy via regular USPS, first class mail, with no tracking information within 10 business days. At the client’s option, Writ Legal can also expedite the delivery of original documents to the client, with tracking information for an additional fee(2). Writ Legal will return the original documents to the client via the delivery method specified in writing, based on the delivery address furnished to Writ Legal at the time Service is requested. If no delivery method is specified and/or no delivery address is provided, Writ Legal will cause the documents to be sent to the address presently on record with Writ Legal via USPS, first class mail. Actual delivery of shipped documents is not guaranteed by Writ Legal. In no event shall Writ Legal be liable for actual delivery of the documents to clients upon deposit with any mailing or courier service(s). Client shall be solely responsible for specifying a delivery address, shipping method, and supplying complete and accurate delivery instruction and related information. (2) Client will be charged at cost for expedited services through mail courier services, FED EX, UPS, or USPS. Court Filing Policy— Writ Legal’s court filing service fees are equivalent to the service of process fee(s). 1. The client must provide all of the specific details regarding the court filing in writing BEFORE the service is dispatched to the Writ Legal contractor. a. If the contractor has to go to a different address to complete the court filing service then there will be a service fee PER address. charged for the fee of ATTEMPTING to file the documents in question. before the close of business or no later than the next business day (for a routine court filing) in order to avoid incurring fees to the client. 2. Pursuant to a written request, upon the completion of any court filing assignment, Writ Legal will provide the client with proof of printing fees. 3. Writ Legal will advance court administrative fees in respect to court filing on behalf of the client only if the total dollar value of the court filing fees, at the time of the service, are equal to or less than $100. If the cost of the documents file exceeds $100, and the client has not provided the requisite funds to pay for the documents at the time of Service, the documents will not be filed. In the event the documents are not filed, based upon costs exceeding $100, the client will be charged the filing fee and contacted with available options. Based upon the foregoing, clients are encouraged to take all necessary and reasonable measures to ensure that either the cost of filing are less than $100 or Writ Legal has been provided with the requisite funds to complete the transaction. Once the court filing has been completed, Writ Legal will fax or email a copy of the file time stamped document and return the original time stamped document via regular USPS First Class mail with no tracking information within 10 business days. Writ Legal is able to expedite the documents with tracking information for an additional fee(3). Writ Legal will return the original documents to the client via the delivery method specified in writing, based on the delivery address furnished to Writ Legal at the time Service is requested. If no delivery method is specified and/or no delivery address is provided, Writ Legal will cause the documents to be sent to the address presently on record with Writ Legal. In no event shall Writ Legal be liable for actual delivery of the documents to clients upon deposit with any mailing or courier service(s). Client shall be solely responsible for specifying a delivery address, shipping method, and supplying complete and accurate delivery instruction and related information. Please see our rates schedule for further details. (3) Client will be charged at cost for expedited services through mail courier services, FED EX, UPS, or USPS. Service attempted within 5-7 days. Service attempted same day or within 24 hrs. Going Beyond the Service of Process— Beyond the Service of Process webpage is strictly for informational purposes only. This section of the website provides general examples of what other Writ Legal clients have done when faced with similar circumstances. It does not constitute and should in no way be deemed a guarantee, representation, or warranty that any client will obtain the same results. The information is provided to our clients to show the realm of possibilities available in considering and pursuing other avenues in respect to their legal process. Each situation is unique however. Therefore, Writ Legal encourages all of its clients to consult with an attorney in choosing the particular course of action for their respective situation. In the event that Writ Legal encounters any issues with a particular Service, Writ Legal will notify the client, and offer available options based upon the circumstances including skip-tracing, stake-out or detailed due diligence affidavit(s). Writ Legal will contact the client(s) with any update(s) regarding the status of their Service before closing any case based on such client(s) lack of responsiveness. Each email notification will also be posted online for the client’s viewing. In the event that no response is provided within 15 days of the second communication from Writ Legal regarding the status of any pending or active Service case(s), Writ Legal will close the case(s) and offer suggestions to the client regarding alternative steps and a detailed affidavit of Due-Diligence. Writ Legal is not a law firm. It is not engaged in the practice of law and does not provide legal advice or counsel of any kind. The examples outlined and the information contained in this section is not intended and may not be constituted as legal advice. Court Filing of Original Proof/Affidavits of Service and non-service or due-diligence and evasion affidavits— As part of Writ Legal’s service of process fee, Writ Legal returns all proofs/affidavits of service, non-service or due-diligence affidavits of service to either the client who requested the service or the respective court in which the action was filed, depending, as the case may be, on the type of court involved or nature of the affidavit of service required. All proofs of service pertaining to a federal court and non-service or due diligence proofs/affidavits of service will be returned to the client. These proofs/affidavits of service and non-service or due-diligence affidavit of service will be returned via United States Postal Service, regular first class mail (without any form of tracking or delivery confirmation) within 10 business days unless other arrangements have been made to either expedite the proofs/affidavits of service and non-service or due-diligence affidavit of service via Fed Ex, UPS or other shipping solutions; in order to comply with a court deadline OR at the client’s request for tracking information or delivery confirmation. Notwithstanding the foregoing, Writ Legal will ship these documents to the client via the delivery method specified in writing, based on the delivery address furnished to Writ Legal at the time Service is request. If no delivery method is specified and/or no delivery address is provided, Writ Legal will cause the documents to be sent to the address presently on record with Writ Legal via USPS, first class mail. Actual delivery of documents shipped, however, is not guaranteed. Policy Regarding the Handling of Client’s Original Paperwork— If an original document (i.e. summons or citations) must be returned with the client’s original affidavit of service in compliance with any court’s filing procedures or requirements, Writ Legal kindly asks clients to retain the original document ONLY in the event that it is not required to be served. If a client submits the original paperwork, the client must indicate in writing that the original paperwork must be returned with the original affidavit of service. Notwithstanding the foregoing, Writ Legal shall not be held liable for documents lost or misplaced during the handling of your service. Advancing Witness Fees— If a witness fee must be served along with a service of process, Writ Legal will determine the fee amount based upon information provided by the client in writing. After the witness fee has been calculated, the total dollar value will be confirmed with the client. If the client refuses to confirm the charges for any reason, Writ Legal shall not be liable for any inaccuracies or miscalculations relating to the witness fees as it is the client’s sole responsibility to verify the exact dollar amount in writing and enclose the witness fees along with the service of process fees. Writ Legal will advance a witness fee in the amount of no more than $100 USD in any case(4). However, witness fees will only be advanced for existing clients who are in good standing with our accounting department. For all new clients, Writ Legal will advance the witness fee only if satisfactory proof of intent to reimburse is provided by the client, in writing, prior to commencement of Services. It is exclusively the client’s responsibility to specify and confirm the delivery method and shipping address where the proofs/affidavits of service and non-service or due-diligence affidavit of service should be shipped or returned. The client may also provide Writ Legal with a pre-paid shipment label to be used in order to expedite or facilitate delivery of the proofs/affidavits of service and non-service or due-diligence affidavit of service OR at the client’s request, Writ Legal will expedited a proofs/affidavits of service and non-service or due-diligence affidavit of service or provide a tracking or delivery confirmation for an additional fee. In no event shall Writ Legal be liable for loss, misplacement or actual delivery of the documents to clients upon deposit with any mailing or courier service(s). Client shall be solely responsible for specifying a delivery address, shipping method and supplying complete and accurate delivery instructions and related information. (4) A minimal witness advancement fee is included in the fee amount determined by Writ Legal. Quick Quote Feature— The Quick Quote is a feature on the Writ Legal website for new clients who are would like an expedited rate quote for services. The rate quote is only an estimated cost for services and should not be misconstrued as a contract between client and Writ Legal or a confirmation that service will be provide to client by Writ Legal. Services are only provided to client when a request for service(s) is submitted in writing and confirmed. If a client request services based on a rapid quote and other services are required or requested, additional charges will be charged to the client. Before, any additional services are provided; client will be notified of all associated fees. Clients located outside of the United States— Clients located outside of the United States who are doing business with Writ Legal may be subject to additional surcharges if they choose to use a credit card as a form of payment. This surcharge shall apply to such clients who are physically located outside of the United States; even if their source of funds is deposited with a United States based financial institution. Clients located outside of the US may choose to pay with an international money order to avoid such surcharges. Writ Legal Blog–– All data and information provided on the Writ Legal Blog is for informational purposes only. Writ Legal makes no representations as to accuracy, completeness, currentness, suitability, or validity of any information on the Writ Legal Blog and will not be liable for any errors, omissions, or delays in this information or any losses, injuries, or damages arising from its display or use. All information is provided on an as-is basis. These Terms and Conditions of Use apply to you when you view, access or otherwise use the blog located at www.writlegal.com (the “Writ Legal Briefs”). The blog is owned by Writlegal.com (Writ Legal, LLC). We grant you a nonexclusive, nontransferable, limited right to access, use and display the blog and the materials provided hereon, provided that you comply fully with these Terms and Conditions of Use. Get Started— By completing the Getting Started form on the Writ Legal website, a client is requesting Writ Legal to contact the client in most cases by telephone or email. This form is provided to the client to be used to request information. The information provided by the client to Writ Legal through the Getting Started form is only for Writ Legal’s use and will never be spammed, sold, transferred or misused in any manner for marketing or any other purposes. Encryption Notice—Your privacy is very important to us. We work to protect the security of your information during transmission by using a 128 bit Secure Sockets Layer (SSL) software, which encrypts information you input. This is designed to provide the maximum protection of your information to form a secure link between your browser and our website. This capability assures that your information cannot be manipulated or misused by anyone during transmission. This includes but not limited to any information being submitted through the Getting Started form, Contact Us form, Quick Quote forms, or the Submit a New Job form.